We all know that a grid down, disaster situation, which we hope never happens, would be physically exhausting. Just think, how long would it take you to walk home from work. If you work downtown and commute from the suburbs, it may take a whole day or two. In a long term collapse, you may have to evacuate and leave the city on foot, carrying whatever supplies you can take with you. Even worse, if some ruffians were trying to rob you, can you possibly outrun them? You may not consider “getting in shape” a skill you really need to be prepared, but if you really think about it, having some endurance and stamina would really help you physically cope with what lies ahead. Even if nothing happens, all of us would benefit from working out on a regular basis. I wanted to gain some cardiovascular exercise as well as build strength. The fitness plan has to be free and easily accessible. No gym memberships for me, I don’t have the budget for a new bill. It can’t be too time consuming, as I work full time and write on my free time, there is not much time for anything else. I started going up and down the apartment stairs to get in shape. The first day I did it, I felt good and kept doing it for 10 minutes. What I didn’t realize was, the soreness does not come in until the next afternoon. Because I overdid it, I was so sore I could not move my leg to even take one step! I had to recuperate for a couple of days before I could start back up. I did the routine in five minute increments, until I got used to it then increased five minutes each time. Once I got used to going up and down the stairs for 15 minutes straight, I started carrying a full backpack. I filled an old backpack with rice, beans, sugar, industrial size peanut butter until it weighed close to 20 lbs. I started slow and easy, doing five minute increments. If you encounter anyone they will assume you are getting in shape for a backpacking trip. I actually see quite a few people walking around town with a full backpack, so it doesn’t raise any eyebrows. I do this workout every other day, giving my muscles time to rest in between. After a few weeks of doing this, I feel a lot stronger and more energetic. Note: I am not a fitness professional. This is not to be taken a recommendation or advise, just sharing my new exercise routine. Check with your doctor before starting any fitness program. Make sure you stretch before you start the workout. Do some marching in place, swing your arms around. Do not overdo your first time-you may feel energetic but you will feel sore the next day. Wear sturdy athletic shoes that protect your feet. Go with a buddy or only use stairs that are well-lit and secure. If you see someone who “gives you the creeps, steer clear and go later. Music is optional but helps relieve boredom. If you have an MP3 player, listen to some lively songs to help get you going. If you have bad knees, this may not be the workout for you; instead do a gradual walking program and carry the backpack when you feel ready. Bring water and a small towel for when you get sweaty. If I ever had to run out of the city, I hope to be fit enough at least to carry some of my preps. This workout shows me how much preps I can actually carry. 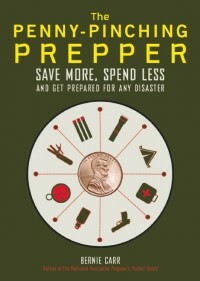 Don’t forget, I will be on Get Real–Get Prepared with Vickilynn Haycraft by Preparedness Radio at 6 pm, today 4/28/2012 from 6:30 PM – 7:30 PM Eastern. Here is the hyperlink to the show. You can access it live at 6:00 PM or listen to it archived, anytime after 7:30 PM. Why Get in Shape if You are Not Planning to Bug Out? I love this post! I also hate the gym and at our house we have been debating whether dehydrated food causes weight gain. Maybe it’s lack of exercise since moving into the smaller place! Glad you like the article Angela! Moving can de-rail anyone’s plan to get fit. You’ll feel better as soon as you start back up again. This is an idea I’ve been using for a little while now. We are lucky enough to live not far from downtown, well, lucky in one sense anyway. We frequently use our backpacks to haul our purchases home, and I realized that the added weight was making us healthier. Not only were we getting our cardiovascular training in the form of a walk, but we were weight training as well. I too felt the effects of doing too much at once, especially if I did a two mile walk with weight and then went to my job which involves standing on my feet for 7 hours! Moderation became my key word to live by. Thanks for a great post. It’s always nice to see others thinking about the same things I do. At least now I know I’m not “crazy”. Hey Carolyn, It’s nice to know someone else is thinking along these lines! I hesitated just a bit before “putting it out there” about this plan as it may sound nutty at first 🙂 But I figured, it’s been great so far so why not. Thanks for sharing! I have no affiliation with Heavyhand whatsoever, BTW. Hi don Roberto, Thanks for the tip about Heavyhands, I will check our library. Appreciate the comment!